Herman Cain grew up in Atlanta, Georgia with loving parents and little else. His father worked three jobs–as a janitor, a barber and a chauffeur–and his mother was a domestic worker. knew that if they kept their faith in God, faith in themselves and faith in the greatest country on the Earth, they could achieve. The first dream was realized in a modest brick house on Albert Street in Atlanta, Georgia. After years of saving from his many jobs, Cain’s father surprised the whole family, even his wife, by purchasing a home for their family. The second dream was realized when Cain graduated from Morehouse College with a degree in mathematics in 1967. His brother, Thurman, would go on to graduate from Morris Brown College. Inspired by the work ethic and character of his parents, Cain continued his education by earning his master’s degree in Computer Science from Purdue University while working full-time developing fire control systems for ships and fighter planes for the Department of the Navy. Though Cain enjoyed using his talents as a civilian employee for the Navy, he gravitated towards the culture of business. Cain returned to his home of Atlanta to begin working as a computer systems analyst for the Coca-Cola Company. After considerable success at Coca-Cola, he moved to the Pillsbury Company. Within a short period of time, Cain rose to position of vice president. Although the comforts of a corner office on the 31st floor of a majestic corporate building seemed satisfying, Cain knew that he needed a challenge. Cain became the regional vice president of Pillsbury’s Burger King division. This meant starting from the “ground up,” dodging grease fires and broiling hamburgers. Cain was assigned to lead a low performing region of 450 of their restaurants. Within three years, it became the best performing region in the company. Energized by overcoming the many obstacles of his job at Burger King, Cain took on the biggest challenge of his career. He accepted the call to become the president and CEO of Godfather’s Pizza, a company that was teetering on the edge of bankruptcy. In just 14 months, Cain returned Godfather’s to profitability and he led his management team to a buyout of the company. His professional successes garnered the respect and admiration of industry peers who named him the president of the National Restaurant Association. Under Cain’s administration, the group grew significantly and began to lobby for the interests of America’s restaurateurs and small business owners. In 1994, as head of the National Restaurant Association, he had the opportunity to speak with President Clinton during a nationally televised town hall meeting. Here, Cain challenged the President regarding the impact on businesses if his health care overhaul proposal were passed. President Clinton attempted to assure him and the millions of viewers watching at home that his legislation would not harm American business owners and their employees. Cain was skeptical. “Quite honestly Mr. President, your calculations are incorrect,” he said. “In the competitive marketplace, it simply doesn’t work that way.” His words echoed across America, and Newsweek named Cain the primary saboteur of Hillarycare. Through these and other appearances on behalf of the National Restaurant Association, Cain began working with business leaders across all sectors of the American economy. This led to his acceptance of a position on the board of directors of the Federal Reserve Bank of Kansas City, and he was subsequently elected their chairman. In this role, he analyzed economic conditions in the region and notified the Federal Reserve of how their policies should respond. 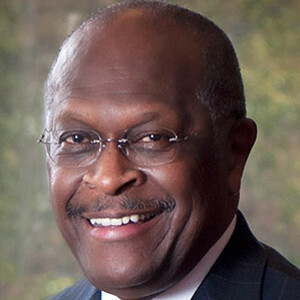 After coming in second in his 2004 bid for the United States Senate in Georgia, Cain soon became the host of his own radio talk show, The Herman Cain Show, on Atlanta’s WSB 750 AM/ 95.5 FM. Today, as a former Republican candidate for the Presidency and seasoned business leader, he remains an active and outspoken voice for conservative issues. In January 2013, Cain began the next phase of his life’s journey with a return to radio and the start of the nationally syndicated Herman Cain Show, heard on many radio stations from 9 until noon daily. To complement the radio show, Cain also established HermanCain.com which offers a constant flow of commentary, news, audio, video, humor and reader-listener interaction.